While the squat may be considered the “king” of all exercises by some, the deadlift sure isn’t a walk in the park. There’s just something so primitive about picking up a heavy weight off the ground from a dead stop that can be just so empowering…but are you doing it correctly? 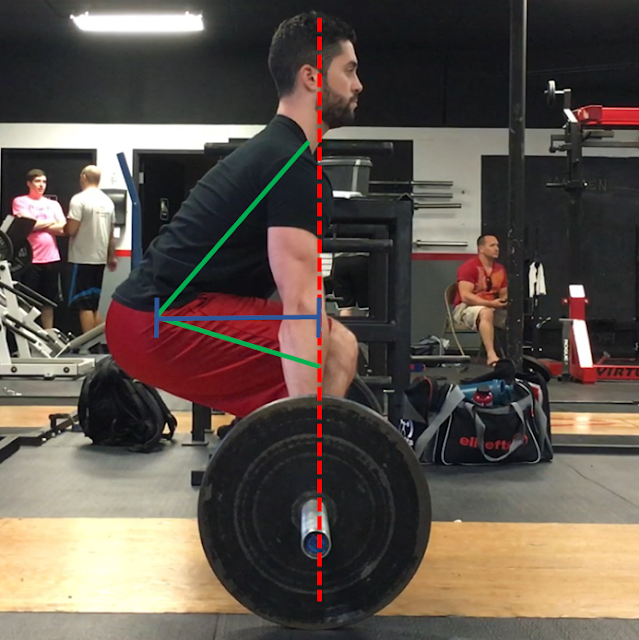 Often times the saying “lift with your knees not your back” is considered to be the holy grail when learning proper body mechanics, forcing people do go into a full squat to pick the tiniest object off the ground, but is this really true? It can be, at certain times, but when it comes to a conventional deadlift, it couldn’t be more wrong. Here’s the truth. You’re probably “mobile” enough to pull from the floor, you’re just setting up incorrectly. In a correct barbell deadlift, the hips start HIGHER than you think. This increased horizontal moment arm (blue line in the picture above) actually DECREASES the efficiency of the lift and puts unneeded stress on the lumbar spine. This set-up is simply inefficient. With the barbell deadlift, the knees are unable to migrate forward, so the trainee results to excessively sitting back. In addition to increasing an unneeded horizontal moment arm, deadlifting with this hips too low also puts your hamstrings on slack, creating further inefficiency. 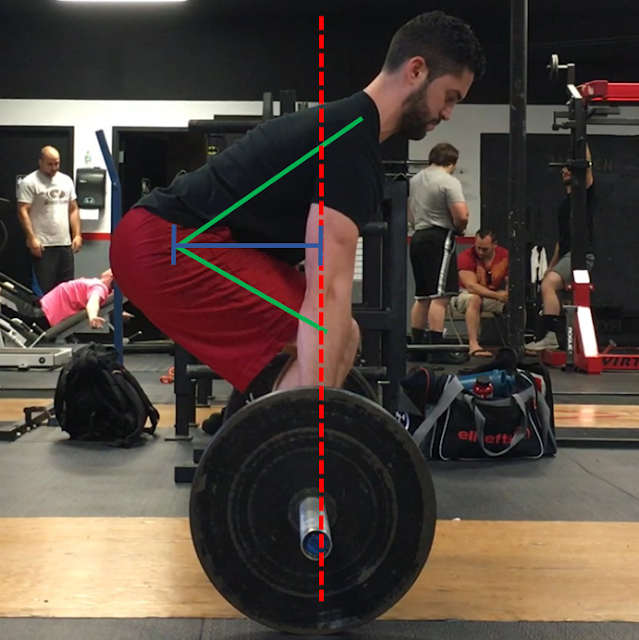 The deadlift is a hip-hinge pattern, and in order to properly perform it, the hamstrings should have a sufficient amount of tension to allow them to produce maximal force. As you can see in the picture above, the hips are higher thus both minimizing the horizontal distance from the lumbar spine to the bar (blue line) AND maximizing the length-tension relationship in the hamstrings to allow them to maximally produce force. One of the most simple cues for the deadlift to promote optimal setup is the “chest up” cue. When utilizing the “chest up” cue, the hips will often naturally assume the position they need to in order for an efficient pull. Check the video out below for proper setup of a barbell deadlift. Cueing “hips down,” on the other hand, often makes the trainee move the hips TOO LOW. What’s interesting about those who set up with the hips too low, as the weight starts to get heavy, the hips will RISE to the correct level BEFORE the bar leaves the ground! This is wasted energy! Start with your hips in the correct position in the first place! Again, we want the hips in the optimal position to minimize the horizontal distance from the lumbar spine to the barbell AND put the hamstrings in the correct length-tension relationship to produce force. Stop squatting your deadlifts, set your hips correctly, and go break a PR!